Richard Overton, the nation's oldest World War II veteran who at 112 was believed to be the oldest living man in the U.S., has been remembered for his love of country and joy for life. 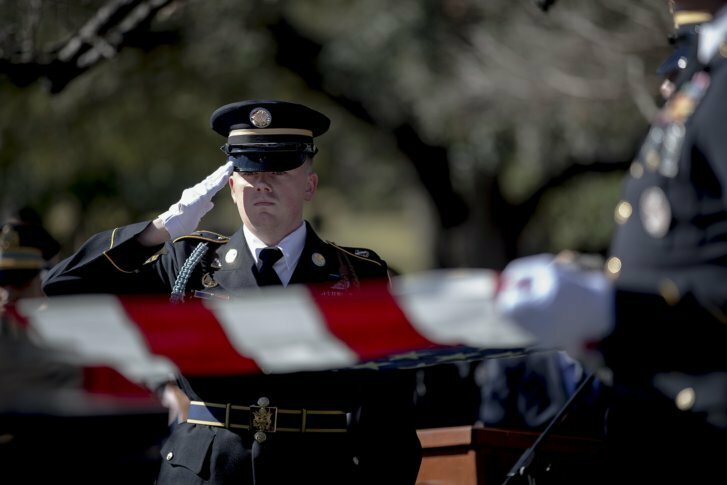 AUSTIN, Texas (AP) — Richard Overton, the nation’s oldest World War II veteran who at 112 was believed to be the oldest living man in the U.S., has been remembered for his love of country and joy for life. Gov. Greg Abbott was among hundreds of mourners honoring Overton during Saturday’s funeral at Shoreline Church in Austin. Overton, who died Dec. 27, served in the all-black 1887th Engineer Aviation Battalion. Abbott said Overton loved the nation and “put his faith in God almighty above all else.” Abbott recalled how Overton, who battled health problems including pneumonia, once challenged the Texas leader to a race using their respective wheelchairs. Then-President Barack Obama honored Overton during a 2013 Veterans Day ceremony at Arlington National Cemetery in Virginia. Burial was later Saturday at the Texas State Cemetery.